Residents along with local, state and federal fire officials chat following a community meeting at North Sanpete High School. In top left corner is Sanpete County Sheriff Brian Nielson. MT. PLEASANT—The Hilltop Fire, which threatened hundreds of structures in the north end of Sanpete County, is pretty much under control, fire officials told attendees at the community gathering at North Sanpete High School Thursday night. 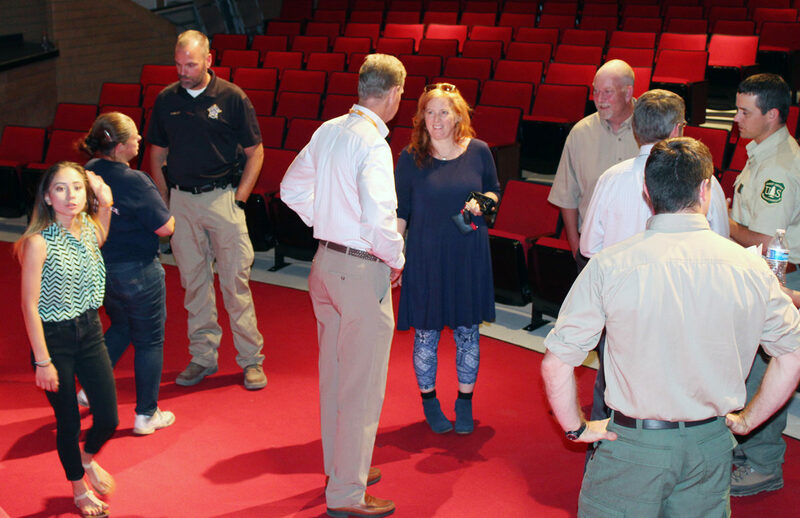 And federal, state and local fire managers gave a lot of credit to cooperation among various agencies and especially to Sanpete County firefighters. “The footprint of this fire, in the location that it is, to be in the position we’re in with the limited amount of loss, is incredible,” Sanpete County Sheriff Brian Nielson told the gathering. That meant people could return to their homes, but needed to be ready to leave again, although re-evacuation didn’t appear likely. In an interview following the meeting, the sheriff also said the Red Cross center at the Indianola LDS Ward would close Friday at noon. In the interview, Nielson said he wouldn’t know for sure about losses for a couple more days, but based on what he knew, no homes had been lost. He said the only significant losses had been one accessory building and one sheep camp. But he added, “There have been some amazing saves” of homes, particularly in Millburn. Leading off the briefing of resident was Dave Vining, planning chief for the Great Basin Incident Team 4, a U.S. Forest Service fire fighting team of about 50 that took command of the Hilltop as well as Coal Hollow fires a couple of days ago. Tim Roide, incident commander of the team, said the group had been working on a fire outside Reno, Nev. when they got the call on Tuesday to come to Utah. Their camp, including food and medical trailers, is set up across U.S. 89 from the Indianola Valley fire station. Nielson said three things contributed to fairly rapid containment of the Hilltop fire. First was work by Sanpete County Fire Warden Tom Peterson before the fire ever started to reduce the fuel load in the area. “As you drive up U.S. 89, (you see) some of the trees have been trimmed,” he said. “We also had some divine intervention from Mother Nature,” the sheriff said. He referred to the fact that Tuesday about 2 a.m., winds died down significantly. Crews took a chance and instituted a “back burn” (where a controlled burn is set up to stop the advancement of a fire). That helped contain the blaze.